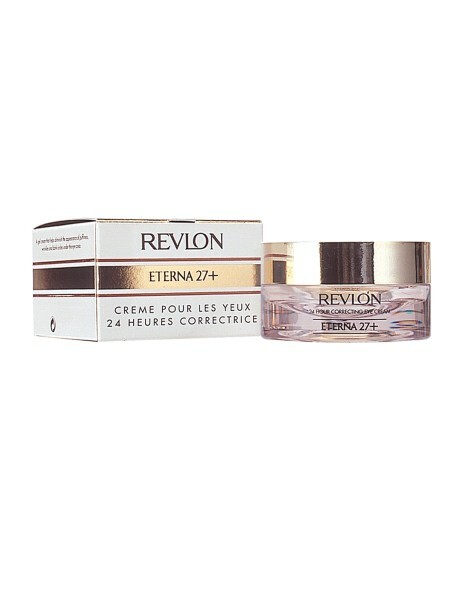 Revlon Eterna 27 24 Hour Correcting Eye Cream - A cooling, lightweight gel cream fragrance free formula. AQUA (WATER). PROPYLENE GLYCOL. CYCLOPENTASILOXANE. PEG-32. DIMETHICONE. CAPRYLIC/CAPRIC TRIGLYCERIDE. GLYCERYL STEARATE. TOCOPHERYL ACETATE. PEG-100 STEARATE. PHENOXYETHANOL. METHYLPARABEN. TRIETHANOLAMINE. CARBOMER. POLYACRYLAMIDE. CETYL ALCOHOL. PARAFFINUM LIQUIDUM (MINERAL OIL). C13-14 ISOPARAFFIN. PROPYLPARABEN. PEG-75 STEARATE. BUTYLPARABEN. ETHYLPARABEN. GLYCERYL LINOLEATE. DIISOPROPYL DIMER DILINOLEATE. OCTYL HYDROXYSTEARATE. SQUALANE. GLYCERYL OLEATE. CETETH-20. LAURETH-7. OCTYL COCOATE. STEARETH-20. HEXYLENE GLYCOL. RETINYL PALMITATE. SILICA DIMETHYL SILYLATE. ISOBUTYLPARABEN. ZINC GLUCONATE. ATELOCOLLAGEN. BUTYLENE GLYCOL. FRUCTOSE. GLUCOSE. CYCLOMETHICONE. DIMETHICONE COPOLYOL. SODIUM CITRATE. CITRIC ACID. GLYCERYL LINOLENATE. ASCORBIC ACID. HYDROLYZED SOY PROTEIN, SODIUM METHYLPARABEN. DEXTRIN. SUCROSE. UREA. BETACAROTENE. PANTOTHENIC ACID. COLLAGEN. SODIUM CHONDROITIN SULFATE. ALANINE. ASPARTIC ACID. GLUTAMIC ACID. CI 77891 (TITANIUM DIOXIDE).